There is ample prey - deer and javelina - in the area on the eastern flank of the Santa Ritas where the photos were taken. "It's the best (jaguar) habitat we have," says Jean Calhoun of the U.S. Fish and Wildlife Service. 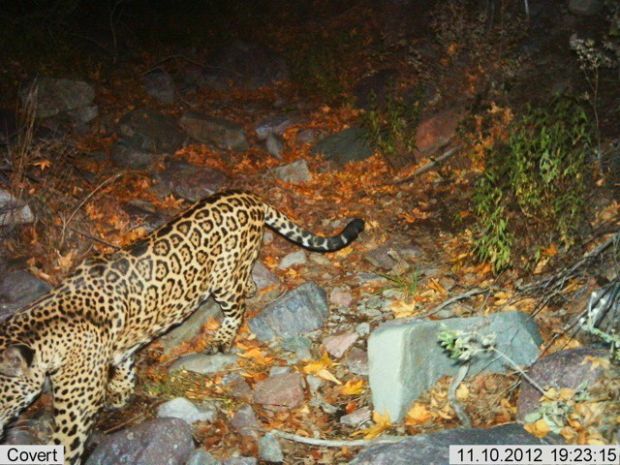 A male jaguar has roamed the Santa Rita Mountains' eastern flank for at least nine months, photos obtained from the federal government show. The photos were taken for the U.S. Fish and Wildlife Service by University of Arizona cameras as follow-up after a hunter gave state authorities a photo of a jaguar's tail that he took last September in the Santa Ritas. While this habitat isn't as good for jaguars as what exists in Mexico, said Jean Calhoun, an assistant field supervisor in the service's Tucson office, "It's the best (jaguar) habitat we have." The area where the photos were shot has prey for the jaguar - deer and javelina - "so as long as there is food available, he is able to hang around there," said Tim Snow, a Game and Fish Department nongame specialist. "To me, it's not a whole lot different" than Macho B, who came and went to different mountain ranges in Southern Arizona. Macho B would stay in the Baboquivari Mountains for awhile, and then move back down to the Atascosa Mountains, and in between authorities didn't know where he went. 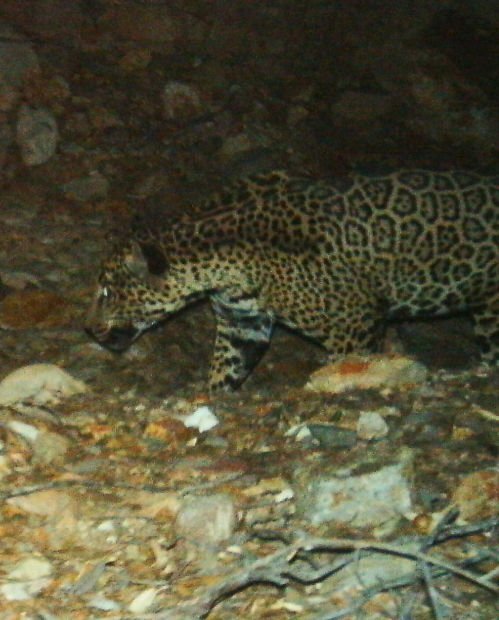 The photos were released as the wildlife service and the Forest Service are wrapping up a draft biological opinion regarding the proposed Rosemont copper mine's impacts on the jaguar and nine other federally protected species, including the lesser long-nosed bat, the Chiricahua leopard frog and the ocelot. The wildlife service hopes to get a draft of the opinion to the Forest Service in a week to a week and a half, Calhoun said. In an earlier biological assessment, the Forest Service wrote the mine is "likely to adversely affect" the jaguar. The biological opinion is supposed to examine measures that can ease a project's impacts on an endangered species. The jaguar's continued presence in the Santa Ritas and elsewhere in the "Sky Islands" mountain ranges of Southern Arizona shows that jaguars belong in this region and underscores the need to protect their critical habitat, said Sergio Avila, a large cat biologist for the environmentalist Sky Island Alliance. "The jaguars are saying it better than anyone else that they belong here - they're making the point, not me or my organization," Avila said. But the new photos don't change Game and Fish's view that jaguar critical habitat isn't justified. "That solitary male jaguar is no reason for critical habitat. We don't have any breeding pairs," said department spokesman Jim Paxon. "If that was critical habitat, we would still be doing the same thing that we are doing today. We are not harassing that jaguar or modifying normal activities there that are lawful today." Because the jaguar's range extends from northern Mexico through Central America and into much of South America, it also is unclear how the Santa Rita Mountains can possibly be considered essential to the species' conservation as critical habitat, said Kathy Arnold, Rosemont Copper's vice president for environmental and regulatory affairs. Michael Robinson, an activist for the Tucson-based Center for Biological Diversity, disagrees. Since critical habitat is legally supposed to be areas essential for conservation and recovery, "it's hard to see how an area with possibly the only jaguar living in the wild in the United States, how that habitat would not be essential to recovery here," he said. Rosemont Copper has been aware of the lone jaguar's presence in the Santa Ritas and the Whetstones for some time, Arnold said. The company has provided some support for the federally financed camera effort, she said. The environmentalists' raising of the critical-habitat issue "is exactly the type of tactics we expect" at a time when release of the final Rosemont environmental impact statement is drawing near, Arnold added. "We are confident that both the Coronado National Forest and Fish and Wildlife Service have concluded that the Rosemont project will neither jeopardize the continued existence of the species, nor adversely affect the proposed critical habitat. At worst, the project may modify this lone male jaguar's roaming patterns," Arnold said. Coronado National Forest Supervisor Jim Upchurch said, however, that the Forest Service hasn't concluded that the mine won't jeopardize or hurt critical habitat for the jaguar since the biological report isn't finished yet.